Every Workplace workstation is custom-configured by our Design Specialists to meet your exact requirements. Drawing from more than 15,000 unique components, already designed, and adding more every day, our Design Specialists are able to put together a solution for even the most unique application requirements. 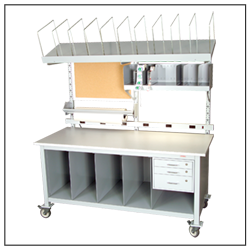 The result is a custom-configured workstation at the catalog price of a pre-built table. Our administrative offices and manufacturing facilities are located on a 15-acre site in Londonderry, New Hampshire, conveniently located near the Manchester-Boston Regional Airport, and just one hour north of Boston. The Workplace complex includes over 92,000 square feet of space, fully equipped for metal fabrication, welding, powder-coat finishing, and packaging of our modular workstations and accessories. Most metal components are fabricated on the premises, allowing for in-house quality control and quick, on-time shipments. Our experienced employees take enormous pride in their work, and they are committed to building the highest quality, most robust workstations available. No task requirement is ever the same. That’s why we’ve designed our workstations and accessories for maximum flexibility, whether your task requirement is for production, assembly, or distribution. Workplace is equally comfortable in a lab, classroom, or research facility. 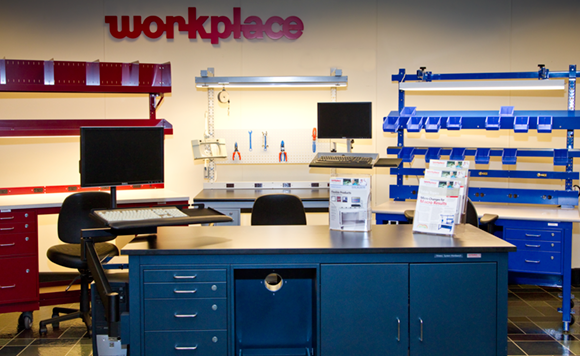 Even if our selection of standard product options and accessories doesn’t meet your needs precisely, Workplace has the engineering, manufacturing skills, and experience to modify existing products. We can even design what you need from the ground up.